Update (10/21/09): Comments for this post have been closed. Thanks for your comments everyone! It has been nearly a year since I wrote this review. It is based on WP e-Commerce 3.6.9 and Shopp 1.0. Both plugins have had significant upgrades since then. I bought a developer license for Shopp and have used it in several projects. I still love it. When I have some more time, I am hoping to give WP e-Commerce another try and post a review the new version. I have been working on a large project for the past couple of months. It is a custom WordPress site for a client, which includes a store. I have never used WordPress for an ecommerce site. The closest I have come is to create a WordPress site and an ecommerce site with matching themes, so that the end user would have the experience of a single site. This solution is not ideal because the site administrator would have to do store administration separately. I had been experimenting with various beta and RC versions of WP e-Commerce (WPeC) from time to time. When I began working on my project, there was a relatively working version of the plugin available. After paying $25 for a single site license for the “Gold Cart” files, my nightmare began. The Gold Cart adds multiple image upload, a product search option, and some additional payment gateways including authorize.net. The first challenge was customization. Making (what should have been) the simple change of showing the product images on the right instead of on the left of the product description involved some pretty insane CSS. And then some more for IE7. And more for IE6. Luckily, I find a CSS challenge to be a fun learning experience. There were a few bugs at first, but nothing that seemed like it couldn’t be fixed. It is here where I would like to mention Shayne from S-Tastic Designs. Anyone who has had the frustrating experience of working with WPeC has probably gotten help at some point or other from Shayne. He is not one of the developers, but I think he may be a top reason why people do not run screaming from this plugin. That, and the fact that there are were no alternative ecommerce solutions for WordPress that offer as many features and payment gateway options. WPeC seems to get buggier with each new release. Enter Shopp, a brand new ecommerce plugin for WordPress. So new that it was just realeased earlier today! Shopp costs $55 for a single site license. Payment gateways other than PayPal Express and Google Checkout require an additional $25 module. I have been beta testing Shopp for a while and have been impressed from the very beginning. 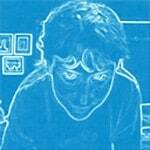 The developer, Jonathan Davis, has been amazingly supportive of the beta testers. He has been available through various means of communication every day and always answers questions in the forums. If you have ever had the experience of trying to get help through the WPeC forums, you will know the joy and satisfaction that this kind of support can bring. So, on to the comparison! Versions tested are current as of today. Shopp v 1.0 with Authorize.net module and WP e-Commerce v 3.6.9 with Gold Cart addon. As mentioned above, Shopp wins. No contest. Display Options – Shopp offers a choice of list view or grid view for store pages right out of the box. The customer has the option to change the view. It took under a minute to make the same display change that I made in WPeC. WPeC has a module called Grid View available for an additional $15. I did not purchase the Grid View module, so can not compare. List view was similar in both plugins: product thumbnails and descriptions. Product links in WPeC were constantly breaking. There is a link in the administration settings to ‘Fix Product Group Permalinks’. Why can’t they fix themselves? Both plugins offer the option for downloadable products. These are handled very nicely in Shopp. After purchasing the download, the client is sent to an order completion page that includes a link to the download. They also receive a nice looking email with order details and download link. WPeC’s implementation of downloadable products was so buggy that I am not even sure I can describe what it is supposed to do. Different versions of the plugin contained different bugs, including no download link in the emails received by the client. One place where WPeC wins over Shopp is in the downloadable product administration interface. WPeC incudes a list of available downloads to choose from, while Shopp wants the product path. The product upload feature did not work for me in WPeC due to the large file size of the products. I did not test this feature in Shopp because the files were already on the server. Product Variations are included in both plugins, but once again Shopp’s implementation is miles above WPeC’s. Product variations are things like different colors or sizes available for a product. Shopp offered more options for per variation settings, such as different shipping fee, product weight, sale price, etc. WPeC’s product variation interface consisted of a few blank text fields with the labels of ‘Name’ and ‘Variation Values’. Promotion handling such as coupon codes and other types of discounts is another place where Shopp shines. WPeC offers the option for coupon codes with a choice of dollars or a percentage for discounts. Start date and end date can be entered, along with additional options to use just once and to apply to all products. Shipping Options were similar for both plugins except that the options actually work in Shopp. Some of WPeC’s shipping options are broken and seem to break even more with each new release. I have been trying to get support for shipping problems for a while now, along with other folks having similar problems. No reply from the WPeC developers. Stores remain unusable. I like Shopp’s administration interface better than WPeC’s. The WPeC admin interface is unusually wide. I have a 24″ monitor at 1900 x 1200 resolution, but I like my browser windows at a more manageable size. The WPeC admin is a little clunky, but overall works pretty well. One feature I really liked is that on the Products admin screen, editable product details appear on the right when you click a product link on the left. I do realize that it is the wide interface that makes this possible. This made switching products and adding or changing details very easy. As far as the actual Product Details section goes, I found it cluttered, but usable. The Shopp admin is much cleaner and for the most part, more intuitive. One thing I found confusing is that you need to select a product type of ‘Shipped’ for items that are not donations or downloads, even if they do not require shipping. It is easy enough to use since all you have to do is uncheck the Shipping box to make shipping options go away and remove shipping references from the cart and checkout. Shopp wins. Do not use WPeC if you value your time and/or sanity. Up until now, WPeC has been the only game in town, but not any longer. Disclaimer: I received a free copy of Shopp after finishing the beta testing. Other than that, I have no affiliation with Shopp and do not receive commissions on sales. Since I have been using Shopp for a shorter period than WPeC, I will update this article if any undiscovered bugs pop up. I am also currently biased against WP e-Commerce due to the weeks of irritation, frustration, and annoyance that it has caused me. It would really be a great plugin if it wasn’t so buggy and had better support. Great video by Brandon Walker! Stumbled across this while reading about browsers at molly.com. I am not completely sure if it will appeal as much to the non-web designer/developer crowd as it did to me. 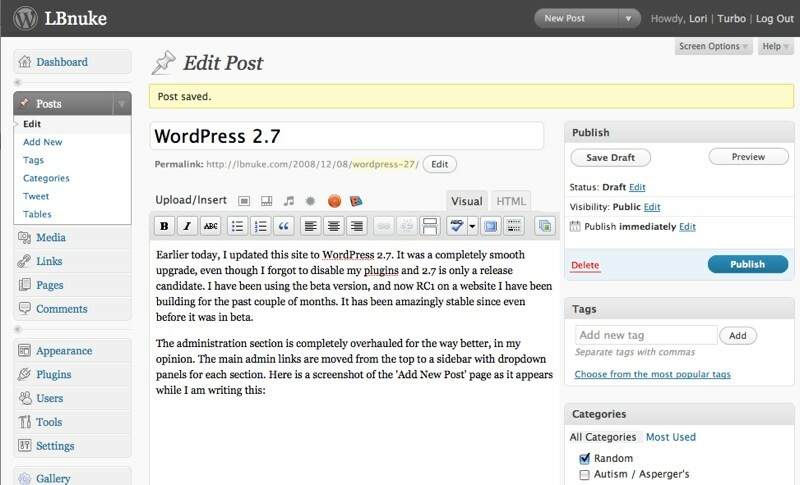 Earlier today, I updated this site to WordPress 2.7. It was a completely smooth upgrade, even though I forgot to disable my plugins and 2.7 is only a release candidate. I have been using the beta version, and now RC1 on a website I have been building for the past couple of months. It has been amazingly stable since even before it was in beta. One of the most exciting new features is the automatic core upgrade. Amazing! Better than that. For someone with a single site, it is amazing. For someone who is responsible for many WordPress sites, it is a dream come true. It has been working, but behaving strangely on the site I have been building. For some reason it always fails on the first two tries and works on the third. No harm is done on the failed attempts. I will see how it goes with this site. Another handy new feature is the ‘Install Plugins’ page where you can search the WordPress Plugin Directory by keyword, author, or tag, or browse by tag, featured, popular, newest, and recently updated. You can also upload .zip files of plugins you have already downloaded. 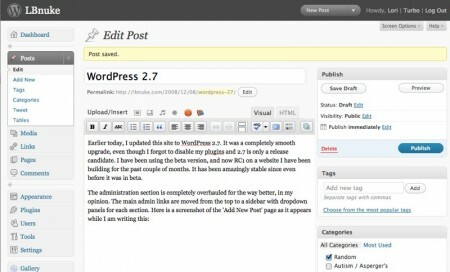 There is much more to say about WordPress 2.7 but I am too tired to say it now. Maybe I will post again when the final version is released. I was kind of impressed with myself for holding out this long before installing it on LBnuke. Don’t think I would have made it if not for having another site to play on. I mean work on. All star cast! Queers! John C. Reilly, Margaret Cho, Neil Patrick Harris, Maya Rudolf, Jack Black! Song, dance, props! Conceived and Written by Marc Shaiman. Thanks to K and Estelle for the link!